It was an usually chilly mid May day, the grass was wet and heavy; when DF, my husband, decided to play gardener. He knew his wedding band was on, he never allows the ring to leave his finger. Sydney and I were baking pain au chocolates, when the phone rang, I heard Sydney exclaim an alarming phrase. My first thought was DF had been hurt by the tracker he was playing on, I was mistaken (thankfully). He had lost his wedding band, we both immediately stopped what we were working on and ran outside. In the front lawn we found my husband, Sydney’s father, walking in a circle. He had panicked and emptied the cut grass in lawn (three times), all he keep saying was he saw his wedding band fall off his finger right in that spot. Since our house stands on five acres and almost a full acre of grass lays in the front portion (to be precise 43,560 square feet), Sydney realized the ring could have fallen off DF’s finger almost anywhere. So while my DF walked in a radius of a 3484 square foot circle, we campused the rest of the front yard. Oh did I mention this was the same day “Harold Camping” wrongly declared the world would expeditiously come to the end, so as the sun was now setting DF declared his life source, force field, and strength had expeditiously left him, he felt his world was ending. As awful as Sydney and I felt for DF, it was time for us to finish our work and reluctantly went back into the house. I, had placed the dough in the refrigerator prior to running outside, as I was rolling it out, when once again Sydney called for me. She was glancing out the front window, and saw DF with head in his hands shaking. The ring of course was insured, but for almost twenty years, the end of june to be exact, his wedding band had be been apart of his finger, he did not want a new ring just the one he had. For some reason I didn’t feel the ring was truly lost, but my husband felt devastated; I decided Sydney and I would create a “wedding looking cake” after I we finished with the pain au chocolate. It was the only action, at that moment, in our power to help him. I won’t claim to recreate our original wedding cake, but all the elements were in this cake. 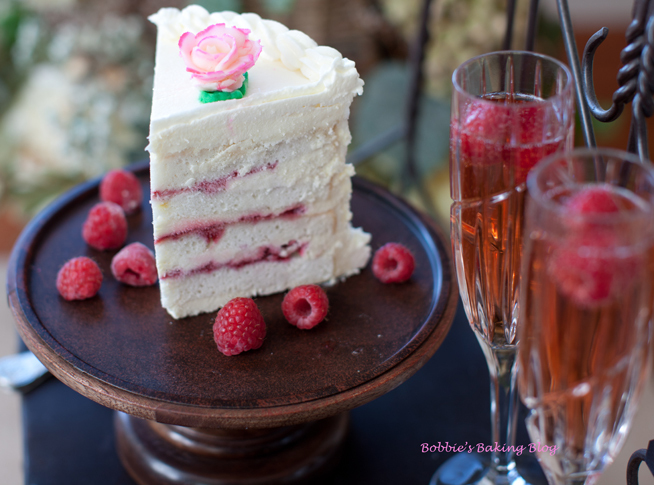 A white cake with raspberry filling, a white chocolate mousse, and white chocolate frosting. I had been teaching Sydney piping techniques. The rose worked perfectly for both venues. DF went to bed agitated and sad, before he fell asleep I suggested buying a metal detector and looking once again the next morning. DF was ready when the stores opened that Sunday to purchase his metal detector, while he searched for his wedding band Sydney and I finished decorating his cake. Believe it or not he was out in the front yard for five minutes when he found his band! WE had spent hours the day before and in five minutes with a metal defector he found it, the irony! Prepare your mise en place, spray and flour 2 8×2 pans with parchment paper. Preheat the oven to 180 degrees C/ 350 degrees F. In a medium bowl combine egg whites, 60 grams/ ¼ -cup of milk and vanilla. In the bowl of a standing mixer, with the paddle attachment, sift all the dry ingredients and mix on low speed just to blend. Add the butter and remaining 182 gram/3/4 –cup of milk. Continue to mix on low speed till the dry ingredients are moistened, raise the speed to medium and beat for about 2 minutes. 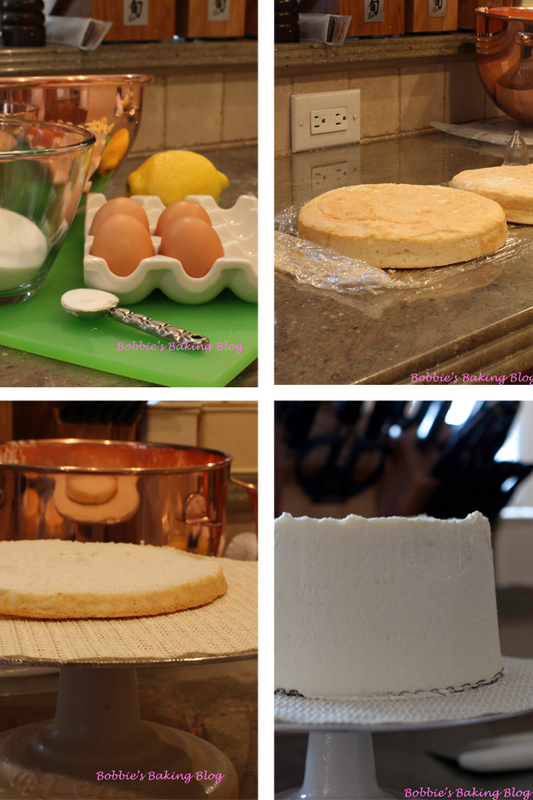 Scrape down the sides and gradually add the egg mixture in thirds, beating for 20 seconds after each addition. Scrape down the sides. Pour the batter into the prepared cake pans, smooth the top with a spatula. The pans will be about half filled. Bake the cakes for about 20 to 25 minutes, or until a cake tester comes out clean and the center of the cake springs back when gently pressed. The cakes will shrink as they cool. Allow the cakes to cool for 10 minutes. Loosen the sides with a metal spatula invert onto a cooling rack lined with parchment paper. Re invert to prevent cracking. Place the white chocolate into a food processor, and pulse a few times. Place 165 grams/ 3/4-cup of cream in a small saucepan, and bring just to a boil over medium-high heat. Add gelatin, and stir for 30 seconds to dissolve completely. Pour into a food processor with the motor running, and process until chocolate mixture is smooth. Whip remaining heavy cream and crème frâiche to soft peaks. In the bowl of a standing mixer, with the paddle attachment place the butter, shortening, and beat until smooth and creamy, set aside. Prepare an Italian Meringue. Once the meringue is cooled beat the beaten butter 1-Tablespoon at a time, add the extract. For the best results place the cooled cake, wrapped in plastic wrap, in the freezer for 20 minutes.After frosting each layer place the cake back into the freezer for 20 to 40 minutes. The first layer of frosting should be thin, the crumb layer. The second layer is the cover layer and then decorate! Using a cake turntable and a 8-inch cardboard round or square, spread a small amount of buttercream on the cardboard so the cake adheres. Slice each cake in half, equally across. Frost the first layer top, pipe an edge and spread some raspberry sauce. Repeat the process for each layer. Frost the sides first and than the top twice. Decorate with a scallop or shell edge and add the roses. 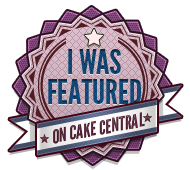 Thats one beautiful cake you have made! Those roses are gorgeous! I think I will try this recipe, often times cakes like these seem to complicated to even attempt but you seem to have written out all the instructions so maybe I will be able to create my own masterpiece! 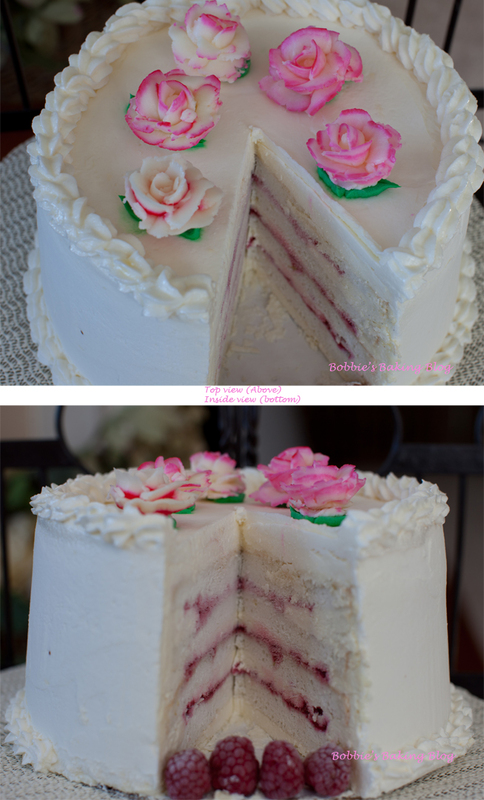 Your blog is amazing, I love this cake, it’s so pretty! But those macaroons that follow me down the page, I don’t like to be followed, haha. just wondering what the fourth ingredient in the batter is 2 7/8 cups of ??? 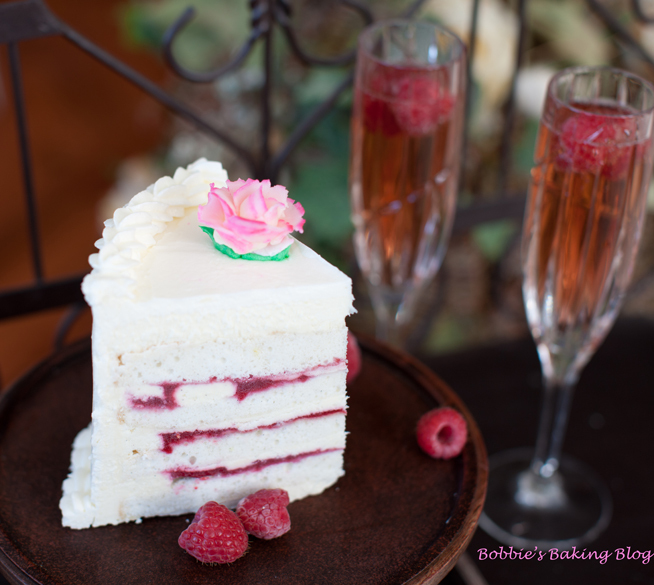 Great blog and sinfully delicious cake. Your pictures are FANTASTIC!!! This cake looks delicious and what a cute story! Well I will be back to take a look at up coming posts and maybe try some of your recipes! Beautiful pictures, saw this one on foodgawker and thought I would come by and say Great Work! Plan on joining your feed! I must say this is a very elegant cake! 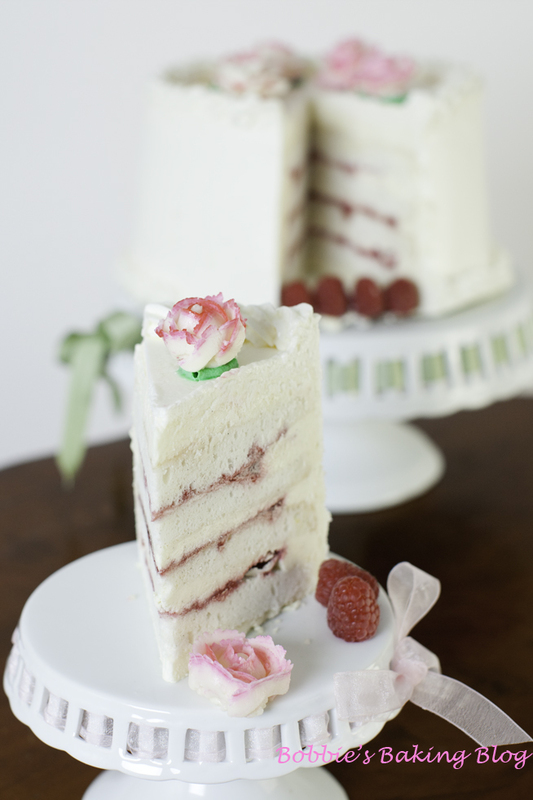 Saw your picture on tastespotting and thought that this looks very similar to a wedding cake! Very elegant and beautiful! Quella torta deve essere così delizioso, bello anche solo da guardare! Yummy Cake! And wonderful pictures, this cake is so beautiful! Every week I look forward to opening my email and finding a new post from you! Your stories are original and the pictures/ food look amazing all the time! White Chocolate is my favorite so I am so thankful that you made this cake! A masterpiece, those pictures are wonderful. Who does your photos? WOW! Great Work Bobbie! Definitely a “must make cake,” so happy your husband found his ring, and what a great surprise to bake him a delicious cake! I absolutely love this cake!! What an amazing looking cake! I’m so happy that DF was able to find his wedding band! Hello. I would like to make this cake for my birthday on 7 July. But I’m confused as to where to find the raspberry sauce recipe? The links go to gelatine-type things? Is that correct? I apologize the link has been changed; the instructions are detailed. If you need any more help, please email me and I will send the recipe directly to you. 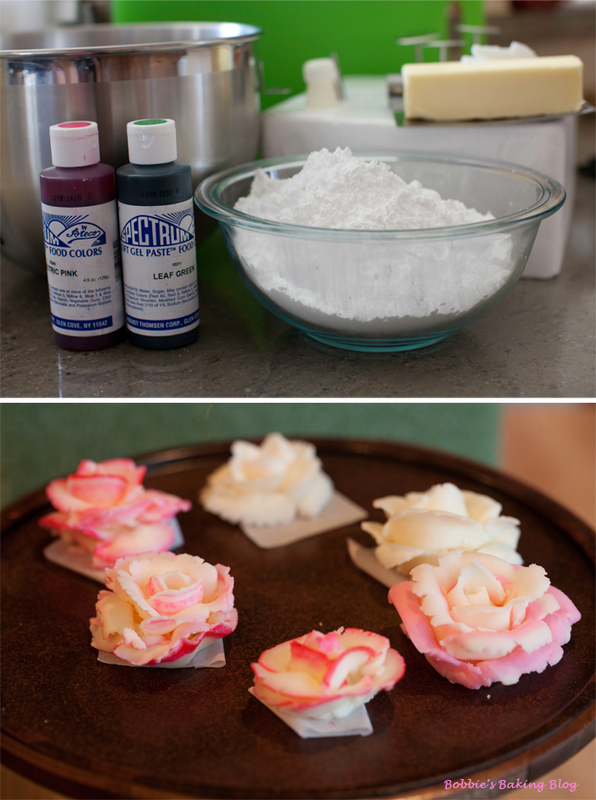 Looks beautiful… I so admire anyone who can make those flowers from frosting! I’d like to make this amazing cake for my husband on his birthday. But I can’t seem to find the amount of gelatin in the White Chocolate Crème Frosting Recipe, would you please, state the amount? Thank you. The White Chocolate Crème Frosting does not have gelatin; sorry for the confusion. I hope your husband has wonderful birthday! Hire a metal detector!!! My mum lost two of her rings while she was gardening and was very upset. My son and I drove over to help her look for them but when I saw where she thought she had lost them, I realised it was too big a job. My husband suggested a metal detector and the next day, he and our son had the best time going over the whole back yard – and yes, they found the rings!!! The man at the hire place said that the main reason people hired the machines was to find lost rings in gardens! And the success rate is 85 to 90%!!! Hi Bobbie, I love the look of this cake and am going to collect some ingredients and have a go, but leaving off the roses this time. I think in the step where you’re discussing how to make the butter cream for the roses you mention making an Italian Meringue, is this for the roses or are we making a separate layer? I was wondering if you could email me the recipe in entirety? I am confused with the website version and the links. I really want to make this for a Christmas party! The recipe on the post is the entire recipe.. I would just be sending the same recipe. Thanks! What a wonderful blog!!! HI Erin, I would keep the cake in refrigerator until you need to display it. Unless in it over 80 degree F the buttercream should do fine for a few hours.